Chandrababu Naidu at INNOPROM-2016 trade fair. 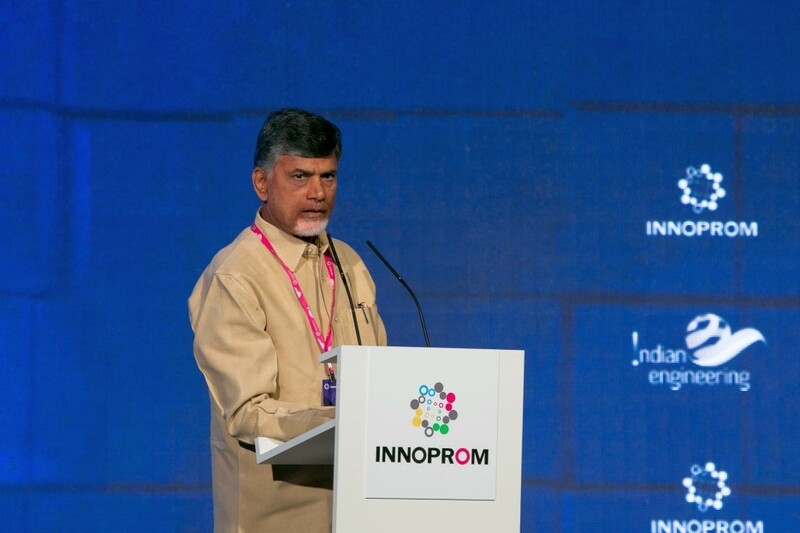 Chief Minister N. Chandrababu Naidu headed the delegation from the Indian state of Andhra Pradesh (AP), which was part of the official Indian delegation to INNOPROM 2016. In an exclusive interview with RIR, Naidu spoke of his ambitious plans to create a "city of the future" and shared details of his meeting with Russian Prime Minister Dmitry Medvedev. Mr. Naidu, has Andhra Pradesh signed any cooperation agreements with Russia yet? This is our first visit in Russia. Most recently, the Government of our Republic and the Russian Federation has agreed on cooperation in nuclear energy, on the implementation of projects with a total capacity of 7200 megawatts. In my state, there are many people involved in this sector, as well as in the agricultural sector. In addition, we are currently negotiating with the Russian "United Shipbuilding Corporation", with a large number of Russian companies from the aerospace industry. As part of our work with rolled steel, we are working with Novolipetsk Steel (NLMK). In general, today there is cooperation in a variety of industries. You met with the Prime Minister of Russia Dmitry Medvedev. What agreements did you manage to reach? The meeting with the Prime Minister went well. We agreed to form sectoral committees to improve our communication process. Dmitry Medvedev clearly stated his position that India is not only New Delhi, and Russia is not only Moscow. We must have inter- regional cooperation. Russia is 5 or 6 times bigger than India, but its population is only 10 per cent of that of our country. India is very strong in information technology, agriculture, pharmaceuticals. Russia is strong in technology, natural resources, so we should work together, complementing each other. Now, in my opinion, only 30 per cent of mutual potential is fulfilled. How many foreign investors are now working in your state, and are there any Russian companies among them? I do not know the exact number, but many countries are involved in our investment projects. At the moment for example, we are engaged in the construction of the "Green City" ‘Amaravati’. It is very important that it becomes one of the top five cities in the world in its final form. The Amaravati Master Plan was established in Singapore, and many states expressed their interest in it. It's not just about China and Japan, which are close, but also the UK, the UAE and others. Which companies are you more interested in as investors: large, medium, or small ones? How much should an investor invest for a project to be considered a priority at the state level? It all depends on the industry and the company. For example, investors want to invest a billion dollars in the steel industry. If we are talking about nuclear power, it is already 15 billion. That is, the projects vary greatly among each other. What conditions does your state offer investors? ‘Make in India’ is a federal programme, under which the regional administrations conduct their investment policies and procedures. We will closely monitor this process, because in our state we can provide land (up to one million acres for industrial construction), water (there are 1000 kilometres of coastline and 12 seaports in the state), other infrastructure to ensure the normal operations of the investor. Currently we are the first among the Indian states in terms of the quality of the work with businesses, because we have a large number of advantages. This is your first visit to Russia. How did you like the welcome you received? Russia is a very beautiful country. Russia and India, in principle, are quite friendly, I know it from childhood. It is not at the state level but at the level of the people. You and I have a very interesting experience of cooperation in the past and want to continue to move in this direction. India is strong with its economy; it seeks only to improve its performance. GDP growth was 7.5 percent last year. I am very pleased that my state has grown by 11 percent, and in the future, we plan to increase this level to 15 percent. Andhra Pradesh is the fastest growing state in India. It’s gross regional product in 2015 amounted to 100 billion US dollars. Today it produces 13,000 megawatts of electricity, and by 2025, this figure will increase to 29,000 MW. The area under petrochemical production occupies 640,000 square kilometres. Also, the state has a strong electrical engineering cluster. Andhra Pradesh is intensively developing its broadband and optical fiber networks and aims to provide 97 per cent of households with all types of communication connectivity soon.